So, you know that pesky mint that you planted some years ago in your garden? And then throughly regretted it because it decided to take over your entire herb garden when in reality, all you wanted was enough to make mojitos once in a while? Yeah, I totally know what you are talking about. My goal for next year is to completely rehab my mom's herb garden. The last few years of her battling cancer, she didn't have the energy to keep the garden maintained. So, plants being plants, have sort of taken over the little space. My first order of business is to transplant the mint to someplace where I don't care if it grows and grows. Now that we have moved into the "main" house (more family oriented), we have kind of inherited a bunch of gardens. I am super pumped to have a proper garden next year! My husband has done something small this year since I didn't want to commit to anything with baby number three coming. Although, even having the small garden on top of CSA, I have been feeling a little overrun! On to this fabulous ice cream. I recently purchased a new ice cream book, because in my opinion, you can never have too many ice cream cookbooks! When I saw the recipe for backyard mint, I thought to myself, aha! 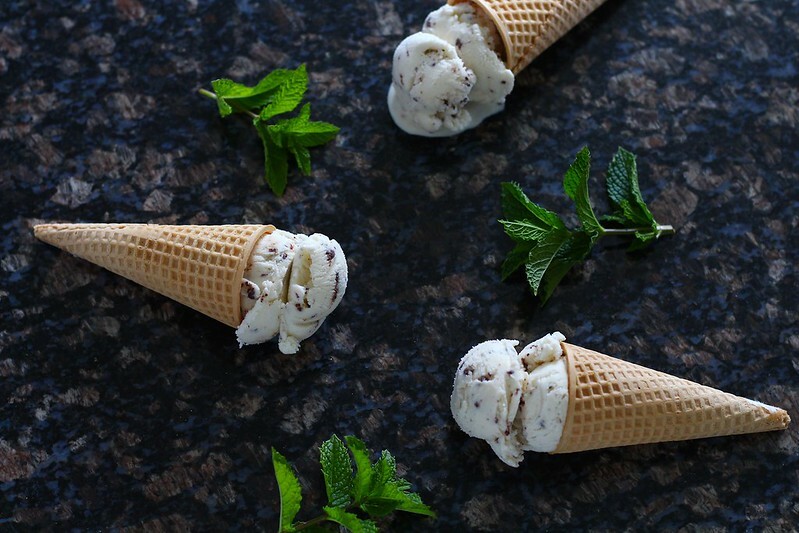 A perfect way to use up some of that ever growing mint. 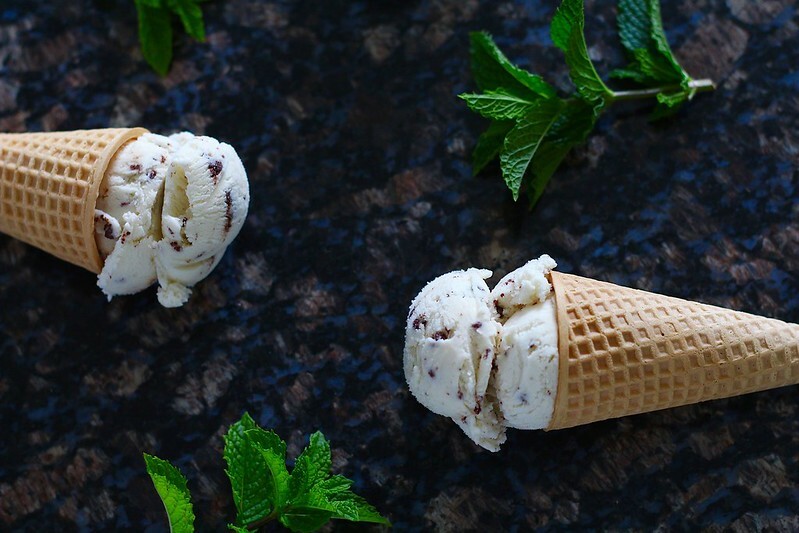 This ice cream recipe starts out with an incredibly easy base, which then you let torn mint leaves seep all night. 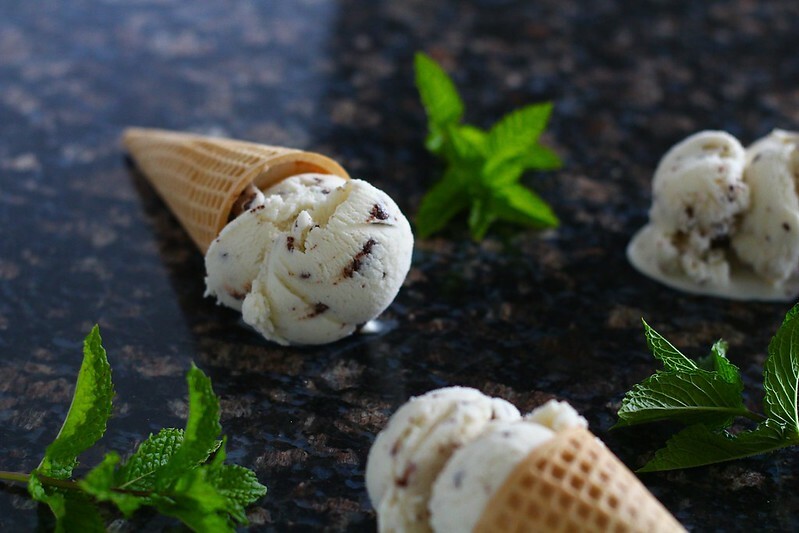 The following day you strain the leaves out and churn the base into a creamy, dreamy ice cream. 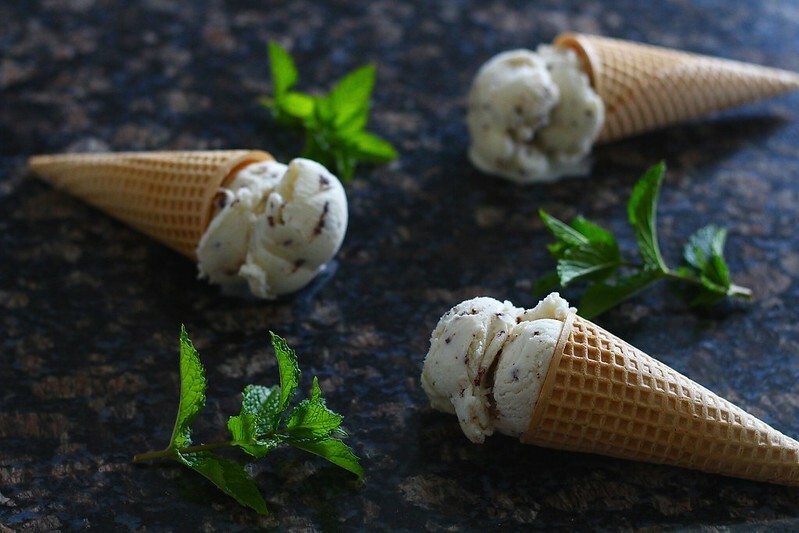 I was telling my good friend on our morning walk one day (yeah, I totally talk about ice cream with my friends because I am that in love with it), and she had the brilliant idea of adding chocolate chips. Brilliant I say. I decided that a sprinkling of mini chocolate chips would be the perfect embellishment. That way the chocolate chips don't freeze solid. Perfect! In a small bowl, whisk together the cornstarch and 2 tablespoons of the milk to create a slurry. In a large bowl or plastic container, mix the cream cheese and salt together until smooth. In a medium saucepan, combine the remaining milk, heavy cream, sugar and corn syrup. Bring to a rolling boil over medium-high heat. Let boil for 4 minutes, stirring occasionally. Remove from the heat and whisk in the cornstarch mixture. Place the saucepan back over the heat and bring to a boil again over medium-high heat. Stir constantly with a heatproof spatula until slightly thickened, about 1 minute. Whisk the hot milk mixture into the cream cheese mixture until smooth. Stir in the torn mint leaves. Cover with plastic wrap and place in the refrigerator to chill and let the leaves seep, several hours or over night. 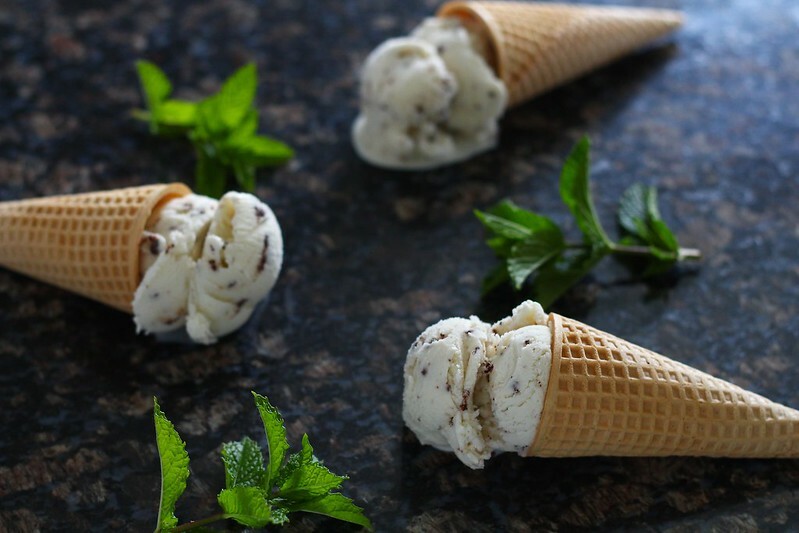 When ready to churn, strain out the mint leaves and freeze in your ice cream maker according to the manufacturer's instructions. If you want mint chocolate ice cream, melt the chopped chocolate in the microwave. Drizzle the melted chocolate into the ice cream in the last few minutes of churning. Store in the freezer.